I’ve known Speaker Andy Tobin for a number of years so in addition to his conservative voting record, I am also supporting Andy for his lifetime of service. He will make a great congressman in CD-1. One would think that the highest law enforcement official in the State of Arizona would be well versed in the law. And given the number of complaints related to elections and campaigning against Tom Horne, one would think he would be paranoid about breaking the law – again. 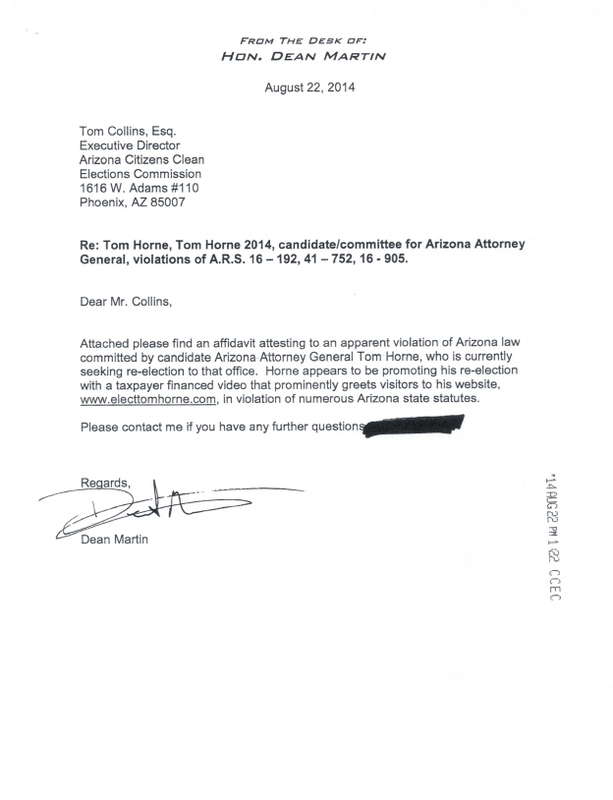 Last Friday, former State Treasurer Dean Martin filed an election complaint against Attorney General Tom Horne over clear violations of the law regarding Horne’s campaign website and the use of taxpayer resources and the State Seal. The complaint was filed with both the Secretary of State and Citizens Clean Elections Commission. It is now one day before the Primary Election and the AG’s race is very close. Given yet another apparent violation of the law by Tom Horne, I ask the readers of this blog to get out the vote for Mark Brnovich tomorrow. A little historical perspective. In 1998, Tom McGovern and John Kaites battled it out in the Primary Election for the nomination for Arizona Attorney General. McGovern won but it cost him all his resources heading into the General Election. Who was his General Election opponent? Some little known US District Court Judge named Janet Napolitano. She didn’t have to spend any money going into her Primary Election and she beat Tom McGovern in the General Election by 50.4% to 47.5%. The rest is history because as we all know, she became Arizona’s Governor and ultimately, Obama’s DHS Cabinet Secretary. Don’t let that happen again. Don’t be that voter. Don’t waste your vote on Tom Horne. The election for Arizona Attorney General is critical. Vote for Mark Brnovich tomorrow. Here’s a link to the PDF file. 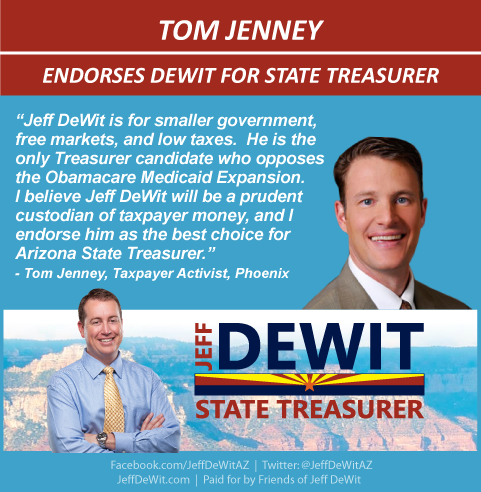 Phoenix – Jeff DeWit, CEO/Investment Professional and candidate for Arizona State Treasurer, announced today that Tom Jenney has endorsed his candidacy. “Jeff DeWit is for smaller government, free markets, and low taxes. He is the only Treasurer candidate who opposes the Obamacare Medicaid Expansion. I believe Jeff DeWit will be a prudent custodian of taxpayer money, and I endorse him as the best choice for Arizona State Treasurer,” said Jenney. Our recent “Go and Vote” video has received over 3,100 views in 4 days. If you haven’t seen it yet, click here. Please help our campaign by sharing this video with others. About Jeff DeWit: Jeff is a successful CEO/Investment Professional with over 21 years of experience. For more information about Jeff DeWit and his campaign for State Treasurer, please visit www.JeffDeWit.com. 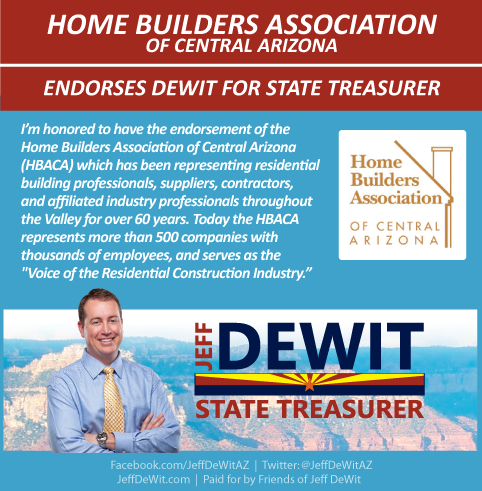 You can also follow campaign updates on Facebook at www.facebook.com/JeffDeWitAZ or on Twitter at @JeffDeWitAZ. “As I say frequently, Arizona needs leaders who will promote a thriving business community, as I will. The path to success for our State involves growing our economy and bringing in jobs, and I will be very supportive of our future Governor in making that happen,” said DeWit. Our recent “Go and Vote” video has received over 3,100 views in 4 days. If you haven’t seen it yet, click here. Please help our campaign by sharing this video with others. Interesting article recently in Politico that details how Democrats are preparing their talking points on the premium shock about to hit the healthcare market – right before the mid-term elections. Here’s the article written by Edward-Isaac Dovere. Phoenix – Jeff DeWit, CEO/Investment Professional and Arizona State Treasurer candidate, announced today that Arizona State Representatives Phil Lovas and David Livingston have endorsed his candidacy. “Jeff would make an outstanding State Treasurer. He is the most conservative candidate, has a record of financial management and is the only candidate against expanding Obamacare in Arizona. I wholeheartedly endorse Jeff for Treasurer,” said Lovas. Our recent “Go and Vote” video has received over 2,600 views in 3 days. If you haven’t seen it yet, click here. Please help our campaign by sharing this video with others. Poll: Who Will You Vote For As Arizona Attorney General?